thank you everyone who entered the blog candy posts form the weekend and signed up to follow (or were already followers of) Richard and Miesje's fabulous blogs! Oh, yes, I follow Miesje! Such a talented cardmaker. She creates such lovely works of art and this is no exception! Thanks for featuring her on your blog! I am inspired by Richards work. I am now a follower of his blog. Congrats to the winners! 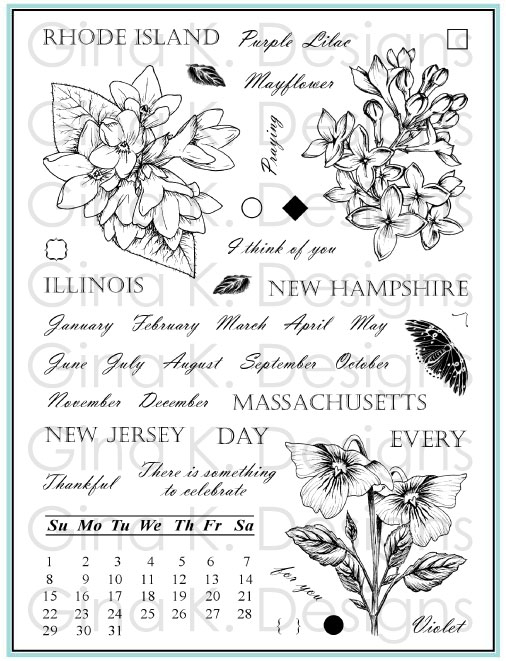 Please email me with your snail mail addy and I will send you a list of stamp sets to choose from. Please contact me ASAP, I am making a post office run tomorrow and would love to put your stamps in there! Good morning, I hope you are having a blessed Sunday! 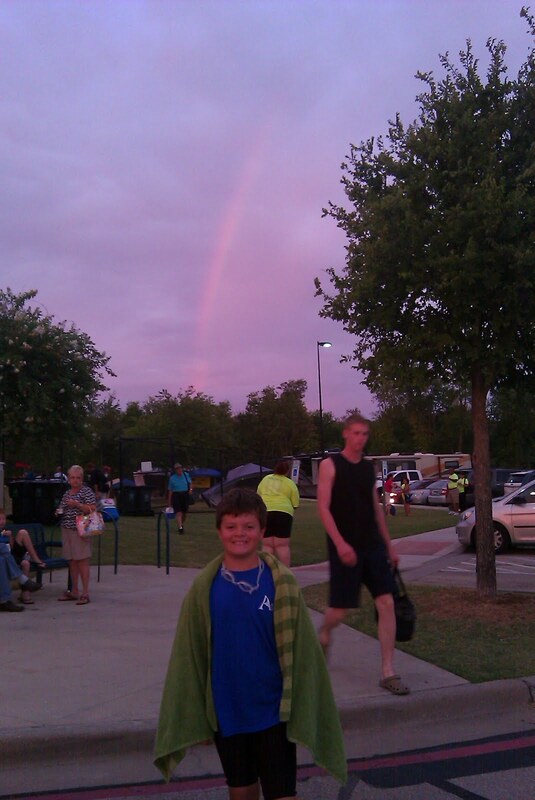 I will be back to announce blog candy winners and share more pictures and details from the State meet yesterday, but I had to quickly post one picture I took at 6:30 AM, just as we were about to enter the pool for warms ups. With the sun rise at my back I asked Jonathan to stop for a photo and he stopped right under this beautiful rainbow that appeared (just a short shower on the drive over, the only rain we got), which gave me such peace and hope for the day ahead remembering all your prayers and God's promises. He swam his best ever. I still need to go through and upload all our photos so for now I'll end with this one verse for now I received through a Bible Verse of the Day email I receive that came the day before we left for the meet. I don't think I've ever gotten one that hasn't spoken to exactly what I or someone I know needs at that very moment. This is a delft tile technique. I stamped with SU Ballet Blue onto a 5x3 3/4" piece of GKD Pure Luxury 120# CS, after I gridded the paper at 1 5/8" and 1 1/4" on my Scor-buddy. I did the scoring so I would have a built-in sort of grout line. I then used a sponge dauber to apply more ink to the edges of each tile, going right over the score lines. Then I applied Versamark to the whole sheet and wet embossed with Inkadinkadoo clear EP, and heated it with my heat tool. I did this 3 times. I carefully cut off the score lines off with scissors, and re-inked the edges with more Ballet Blue. I used foam tape to pop the "tiles" off the background. Take your time, and be gentle. Don't press anything down until it's perfect, or there'll be trouble! I layered the background onto black cs, and then onto the white card body. It definitely looks a lot easier than it actually was. I didn't want to add any ribbons or bling, because I didn't want to hide any of the tiles." Hopefully Richard will make more appearances on my blog, but next week we have brand new stamps coming out..and a new guest designer! I really appreciate the beautiful designs Richard has done this month and I'm sure you do, too! Lets have more candy, shall we? Please sign up to follow Richard's blog and then leave a comment here you did so for a chance to win a free stamp set from me! He is so darned talented and reading his posts are like sitting down with him and a cuppa, he deserves to have a big crowd following! If you are already a follower if his, let me know you can enter, too of course! I'll post the winner on Sunday night along with THE RESULTS from the state meet! Good luck! I went with a fall theme on this one. I used chalks on the leaves and gut them out. I also used some sponging on the Cuttlebugged background. The DP is BG Indian Summer. Some twine and a few colored pearls. Are you a follower of Miesje's blog yet? Leave a comment here letting me know if you are already or please hop over to her blog to sign up to follow and then come back and let me know you did! You won't be sorry you did! 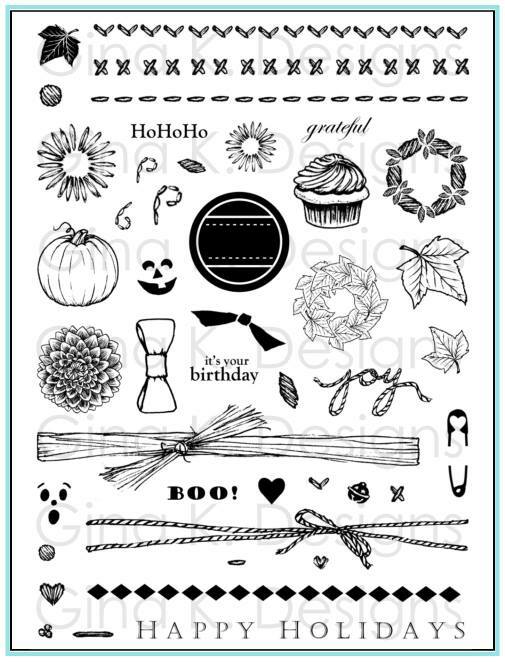 I will draw one winner to receive a free stamp set from me, winner posted Sunday night! Tomorrow's the big meet, eek! State bound! Pray for "my fish", please! If you could please say a prayer he swims well and has peace with the results, also that his goggles stay on when he dives in, we are having issues with this! * I can't imagine how much that would throw me off in competition! Here is the back of City of Austin Salamanders Team T shirt he got yesterday (of course I had to buy a shirt for everyone in the family so we can go as Team Jonathan, hee hee!). Jonathan wants me to draw a big salamander tat' with a Sharpie on his ankle for the races Saturday, I'll have to get a pic of that, and of course pics from the meet,too! I will have spots from Richards and Miesje to post while I am away this weekend for a little more "Vine" inspiration! The summer will be over before we know it and I'll be able to creating and posting on a regular basis, thanks for your patience! I've missed it but have been enjoying my boys so much ! Orange. Honestly, I like all three of them. It was between blue and orange, but the butterfly colors won me over. :) Thanks for the chance to win. Oh they are ALL gorgeous! What wonderful blending and colors!! WOW!!! Impressive!!!! I think I like the orange the best...it pops out...and love all of them with the little ladybugs popping out too!!! I must admit, I love them all. If I have to choose a fave, I would have to pick the blue one. Blue is my favorite color. More blog candy coming soon! Hope you had a terrific weekend! 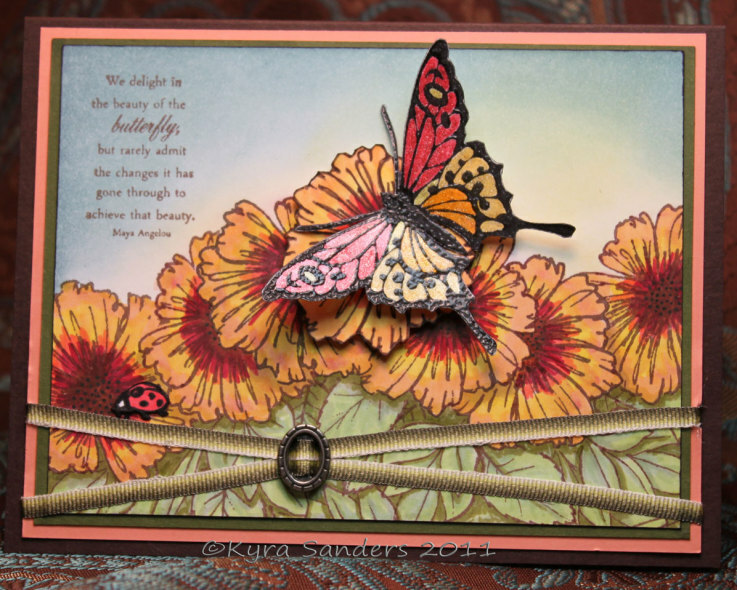 So while I'm trying to whip up a little "line em up" tutorial I got requests for , I just had to share you with some FANtastic cards made with "A Year of Flowers" from one of our StampTV fans Kyra! Busy as I am this summer, I still find a moment or two when I can to prowl around the STV gallery and am always on the lookout for exciting work with my stamps (She didn't know I would be showing these) but they are just the bomb, some of the most beautiful masking I've seen to create these lovely bushels of leaves (using two different leaf images from the set and the dark shading around them really adds so much depth! The barely there sponging she added for the sky is amazing too and I love those little pops of red ladybugs! 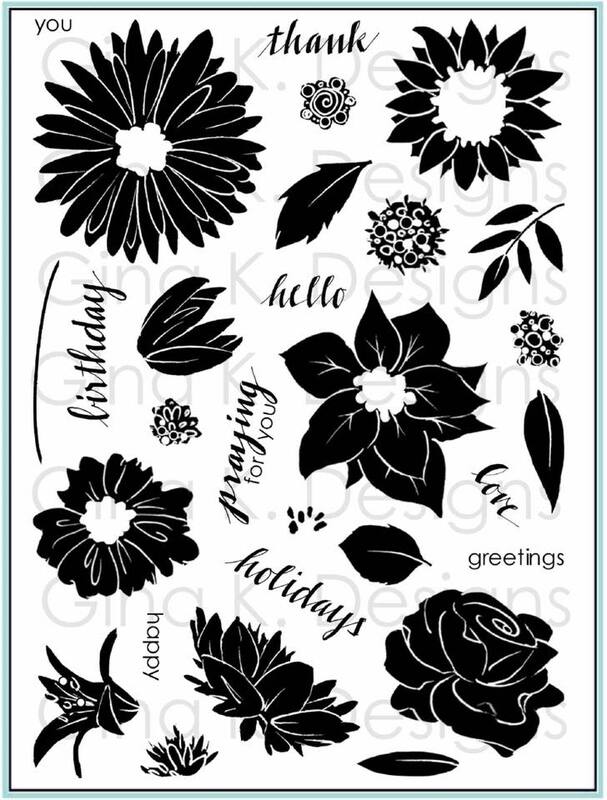 Gorgeous work Ky, thanks for the inspiration, and please email me for a free stamp set today for doing such cool things with this set and spicing up my blog today!! :) Everyone else, be sure to visit her wonderful gallery on StampTV and then read below for a chance at some blog candy for you! Seriously I cannot pick a favorite, all these color combos are heavenly! 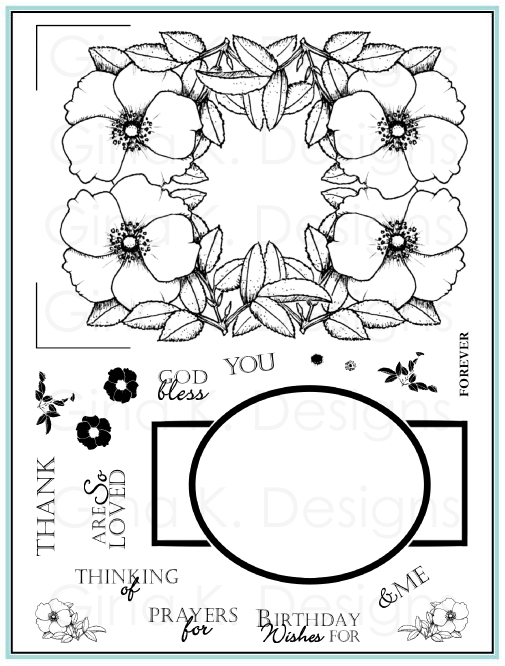 Tell me which of these flower samples you like best, purple, orange, or blue, in the comment section for a chance to win of my stamp sets! I will draw a winner tomorrow and announce it on my blog, then email that person with a choice of sets to choose from! Please be sure your comment has an email addy or goes to a profile with an email address to contact you, thanks! Thanks to all of you who continually load the gallery with so many lovely projects and ideas using my sets, you just may find your work featured here soon! :) Thanks for visiting!!! Welcome to week 2 with Miesje!! Today Miesje decided to step out of her card comfort zone today and create a 3D project with "The Vine", this gorgeous jar! I think you'll all agree with me after seeing this she should step out more often, with confidence! :) She was very clever to make a clear wrap for the jar instead of trying to stamp directly onto the curved vase which can be tricky. Also this allowed her to color on the back side with Copics to prevent smearing the images. Miesje's details: I stamped the vine on transparency with StazOn and then colored on the reverse side of that with Copics (yg61,yg67, yg63). The flowers were all on Pure Luxury white, colored with Copics (R89, R35) and cut out. I stamped the sentiment on white, used the Spellbinders tag and then some distress inks. I added some pearls to the flowers and some ribbon. I have been married to by best friend for almost 40 years! Together we have raised 8 amazing children. All of our children are adopted and have enriched our lives and the lives of each other with their uniqueness. We are very devoted to our family and our faith. We are Catholic and active in our parish. I am a teacher in a Catholic school where our children attended and now several grandchildren roam those same halls. Now that is fun! My DH owned his own precast company for more than 30 years but last year it was time to close the doors and work for another precast company where he is now the GM. He likes it. God has always shown us where to go and, when we listen, it was always the right path. Gosh, do I have a style? I think my style would best be described as basic, if that is a style. Not really sure about this one. My favorite technique is paper piecing and coloring. I am also big on fussy cutting and popping up elements. I am a fall colors person. Pastels are the colors I use least. Pearls, gems, flowers, ribbon. 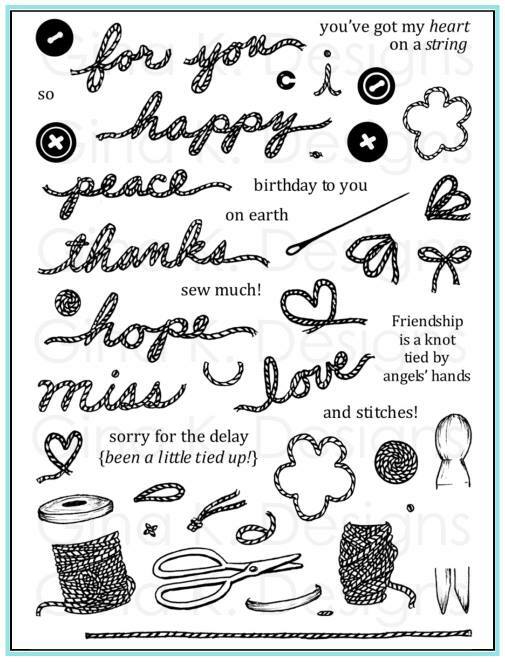 Thank goodness she put an (s) at the end of embellishment or I would have been in trouble! 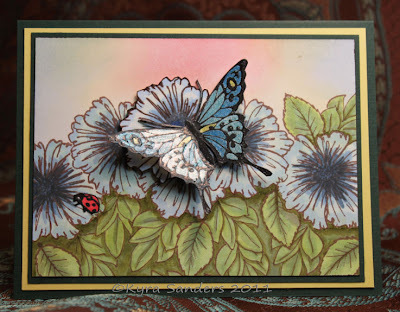 I think that the stamp set I use the most often, especially for those times when you have to make a card quick and the thinking – planning – playing time is limited I have turned to the StampTV set called Spring Mix. It covers a multitude of options and I love the sentiments. Spellbinder dies and designer paper – gotta have em – can’t have too many! Oh – and my Scor-pal – oh wait – Copics – sheesh – can’t forget those! 12 years – goodness, I had not thought about that in a while. Where did the time go? 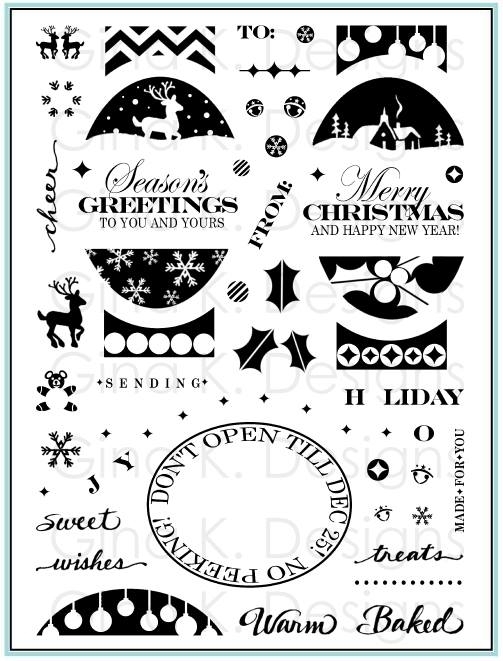 Oh, I know where it went – stamping and shopping for stamping! Tell us about your FIRST stamping experience!! Pitiful! 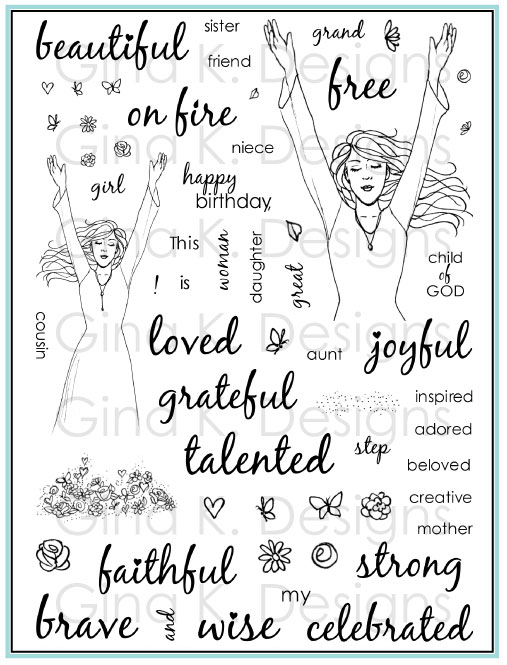 I was invited to a Stampin Up party, did my make and take and thought it was absolutely incredible. Ummm, still have that card ummmm, not so incredible. But it was love at first sight though and I had to have the “stuff”! Tell us about your most MEMORABLE stamping experience!! In October of 2009 when I posted my very first card on StampTV and I got 2 comments!!! There are very few “mistakes” that can’t be saved with an embellishment. Thank goodness or I would have a VERY full waste basket at the end of each craft session! Be brave enough to send in a card to a magazine to see if I can have one published. Don’t be too hard on yourself. It took me many years before I thought I was good enough to put a photo of one of my cards online. Not many, I have altered tins as gifts for people and filled them with the mountains of cards that I have. I was guest designer for Theresa Momber last spring. I almost hyperventilated when I received that e-mail. Wow, what a moment. I was also selected as a Center Stage Design team member for the month of August of 2010, that was incredibly exciting. 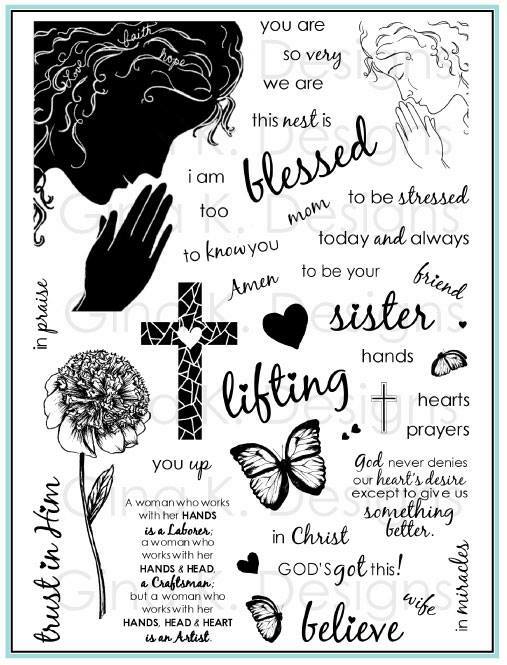 I am on the design team for Stampin Sisters in Christ which is a joy for me! And I was the July Friends of The Crafts Meow this year. 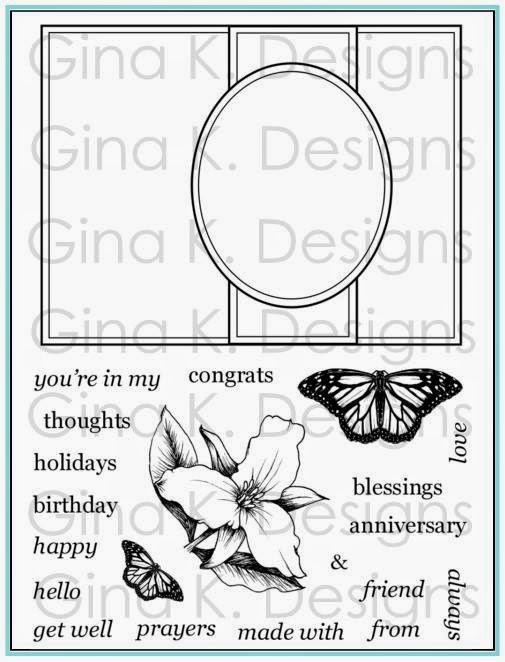 I really like sketch challenges so some of the ones (other than StampTV) that I enter are Card Patterns and CPS. I also enter some other stamp company challenges such as MFP and ODBD. When Lisa asked to guest design for SSIC in May of 2010 I was stunned! I did not think that I would ever make cards good enough and be able to express myself well enough to be part of that incredible team. 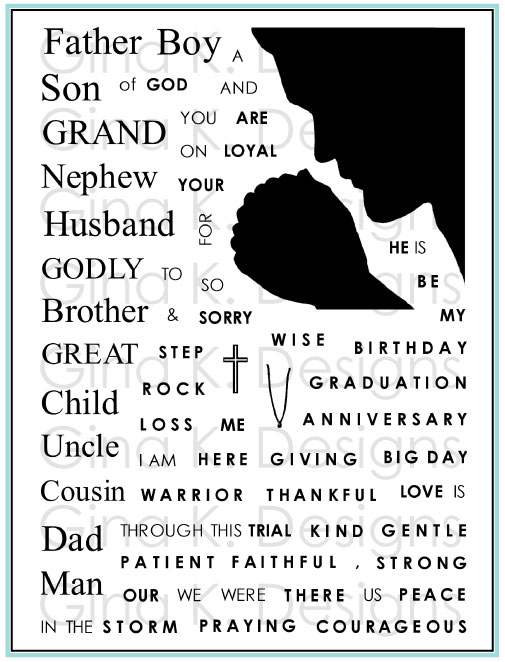 You know, when I started creating a card based on scripture, the cards began to take on a different meaning. I look for sentiments that encourage and show that my first love is to the Lord. It is in giving that you receive and I have received so many blessings through this experience. It is amazing how when I reflect on a scripture verse every week for the challenge my focus for the week changes – I change. I am blessed to work with those ladies and by those who visit the site and leave their own comments. I think I have tried just about every craft known! I used to sew all of our children's clothes, I have quilted, ceramics, macramé, counted cross stitch and probably every fly by night craft that anyone told me about. Stamping has lasted the longest though. TELL US SOMETHING ABOUT YOURSELF THAT MIGHT SURPRISE US! Okay – 2 days later and I am still stumped! I suppose I am an open book. I love to work outside. Mowing the lawn is fun to me. I enjoy reading too. Really though, when I am home and the chores are done – I stamp and stamp and stamp. Don't ya just love her? 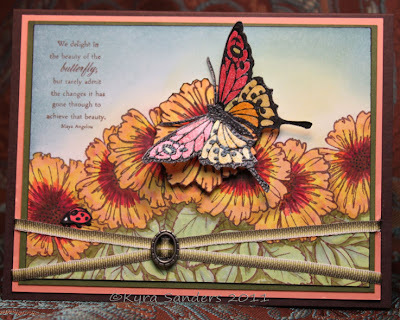 :) Now please give a little love on her blog and check out a beautiful CARD she made with "The Vine"! Thanks for stopping in! Hugs! Happy Tuesday, and welcome to my second guest spot with Richard! Here is a new sample he created with "The Vine" and its coordinating set "Branching Out". You know how much I like brown and this monochromatic sample with the different shades (and just one ink pad! Memento Rich Cocoa) is just lovely, that punch with the stamped vine is fabulous and all the distressing he did on the edges, direct to paper, and watermarked leafy background remind me of beautifully tooled leather. And here is a short Q&A with the man himself! Describe your style/what you think you do best: I like fresh, fun colors, for the most part, but since I am so new at doing this, I find it's hard to really say I have a style yet. I mean, this card is SO dark, and different from what I have done for the most part in the past. COLORS/COLOR COMBO: Orange and any sort of blue-green or yellow-green. I definitely like most shades of blue, as well. And who can argue with a pop of red? Uh, did I forget any colors??? FAVORITE EMBELLISHMENTS: Pearls and rhinestones, for sure. 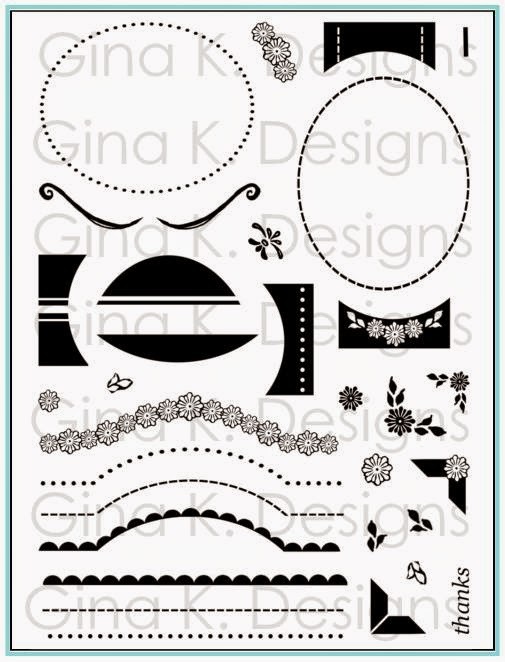 FAVORITE GINA K SET BY MELANIE: Gifts from the Sea, my FIRST GinaK Designs set! FAVORITE GINA K SETS (FROM ANY ILLUSTRATOR) It's a tie between Gifts from the Sea and Enjoy the Sunshine. Both of them are my "go-to" sets. CRAFT SUPPLIES I CAN’T LIVE WITHOUT: My Cuttlebug! My Tombo adhesive and Scor-Tape, my teeny-tiny Studio G Inkpads, and for sure, Memento Tuxedo Black. I’VE BEEN STAMPING FOR (HOW LONG):Two years, really, but I just started in earnest around April of this year. I GET MY INSPIRATION FROM: Wow, so many sources. I think, first and foremost, the videos I see at GinaK Designs, and other sites. Challenges get me going, for sure. Needing a card for someone for a certain occasion will inspire me too. (I think we call that Necessity being the mother of invention.) Sometimes running across an older stamp set or favorite designer paper will spark something. During dry spells, I will search out sketches on various websites to get me started. Tell us about your FIRST stamping experience!! My very first experience was at my friend Stephanie's house. We had just reconnected after an over 25 year separation, and the first thing she does is give me a new addiction, uh, hobby! My bank account will never be the same! Tell us about your most MEMORABLE stamping experience!! Well, DEFINITELY being asked to be Melanie's guest designer! This has been a BLAST, and such an honor. THE MOST IMPORTANT THINGS I’VE LEARNED ABOUT STAMPING/CARDMAKING ARE: KEEP GOING! Even days where you have NO motivation can be good if you just stamp out some images or cut some cardstock while you watch TV. I will often make elements of cards, and put them aside until I figure out the perfect way to use them. 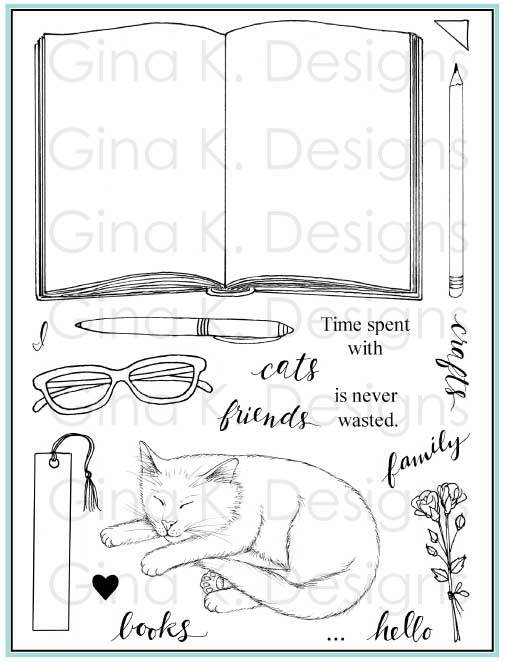 SOME OF MY STAMPING/CRAFTING GOALS ARE: I would ultimately like to be on a Design Team (or 6! ), and I sure would love to change careers and work in the crafts industry. ADVICE FOR BEGINNERS: Buy a good quality paper cutter, and don't load up too much on discount cardstock. You will want to move up to the better stuff before you know it. NEVER pass up a sale on embellishments! How do you think your personality/life experiences shape your art? I have been surrounded by art and artistic people forever. My Grandmother was one of those ladies who literally NEVER sat down without some sort of crafting going on. I also am an actor, and I did one year of graduate studies in Interior Design. One of my very favorite activities as a child was cutting and pasting things together out of construction paper. I feel like I've come full circle! Another art medium I excel at (or would like to try) I would really like to learn graphic design. When I'm not at work or cardmaking, it seems I am here at this computer. FAVORITE THING TO MAKE THAT AREN’T CARDS: Christmas cookies and decorations. Anything I can make shiny. 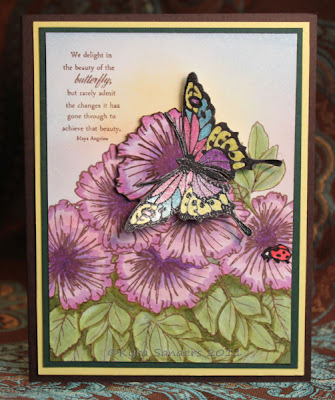 SOME OF MY STAMPING/CRAFTING ACCOMPLISHMENTS: Again, my guest designer spot with Melanie. I think that any card I make that makes people happy is quite an accomplishment! CHALLENGES I LIKE TO PARTICIPATE IN: Color challenges, theme challenges. I find I will often get stuck with a sketch challenge; I have no idea why. TELL US SOMETHING ABOUT YOURSELF THAT MIGHT SURPRISE US! I actually draw pretty well, but I really don't like to do it. WHAT I DO WHEN I’M NOT STAMPING: I like to tan during the summer months, love to travel, and I like to spend as much time as possible with my dear old blind beagle, Celeste. Thank you again Richard for sharing with us today! Please go visit Richard's blog for some more fun stuff! Have a terrific day!! Inspiration Hop, Day 3: "Bold and Beautiful"